Chinese authorities in Tibet’s Chamdo prefecture are ramping up the forced relocation of nomads from rural areas into newly built towns far from grazing areas, leaving Tibetan families unable to cope with the demands of daily life, Tibetan sources say. 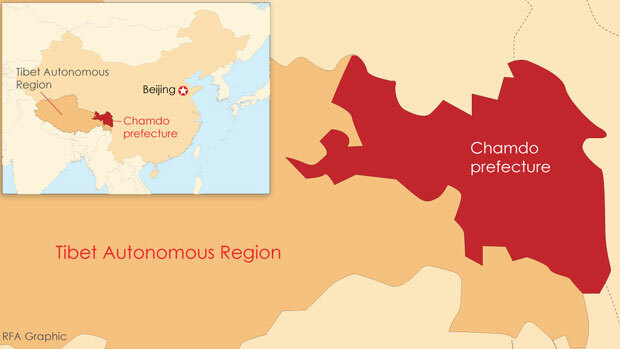 The state-ordered resettlement scheme has already been implemented in Chamdo’s Jomda, Gonjo, Dragyab, and Riwoche counties, with families forced to pay as much as 8,000 yuan for new homes, a Tibetan living in the area told RFA’s Tibetan Service. “Most of the Tibetans being resettled are farmers who have been told by local officials to move to new locations to help lift them out of poverty,” RFA’s source said, speaking on condition of anonymity. “But some are saying they can’t be sure what the real goals and purposes are of the Chinese resettlement project,” he said. Around 40 families from rural areas in Chamdo’s Pashoe county have also been moved to county towns, another source said, adding that many of the families forced to migrate have been unwilling to move to the towns. “But Chinese government promises to provide them with assistance after they get settled have lured them all to move,” he said. Speaking in an interview with RFA’s Tibetan Service, Rinzin Dorjee—a researcher at the Dharamsala, India-based Tibet Policy Institute—said that a growing influx of Chinese migrants into Tibet is already helping to weaken and destroy Tibetan culture and national identity. “At the same time, Tibetans living in rural areas are being made landless through the expropriation of their land,” Dorjee said, adding that ancestral Tibetan lands are now being sold to developers to build industry that will further attract Chinese migrants into Tibet. China has meanwhile not delivered on its promises of jobs, health care, and free education for the children of Tibetans forced to move to the towns, Dorjee said. “And this has resulted in many challenges and difficulties in their day-to-day lives,” he said. The real goal of China’s resettlement project is to manage and control the Tibetan population, “and to keep a close watch on them,” Dorjee said. Reported by Lobsang Gelek for RFA’s Tibetan Service. Translated by Dorjee Damdul. Written in English by Richard Finney.